So my good friend, Trevor Marshall, has been making himself semi-famous on Train-Masters TV building a number of S scale Free-Mo modules to allow him to go out and setup with his friends in the S Scale Workshop. I had the privilege of having a hand in this project. I built the benchwork for the modules and the traveling frames for Trevor over the course of 2 filming days at the Train Masters TV studios in Belleville Ontario. Trevor also had our friend Chris Abbot assist him with the wiring portions of the project, along with some of the roadbed installations. Which resulted in the now famous caulk in the eye incident, which Chris will never live down and will give Trevor, Barry and myself no end of joy to grind Chris on as the years go by. 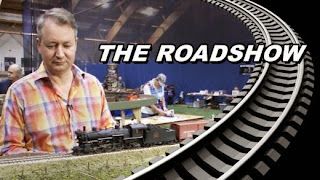 Aside from admiring Trevor's awesome talent and his joy in working S scale, I remain struck by the truth that this hobby is indeed a group effort. While Trevor could have done the whole project solo, it was more efficient and a smarter usage of resources for him to call upon his friends to bring their talents to the forefront and see this project through. The same holds true for home layouts. Very few layouts are true solo efforts, somewhere along the way somebody always helps out with something. And if you include the small manufacturers, like myself, who offer products in part for the love of the hobby, we are a true fraternity of like minded souls. So for that reminder, I thank Trevor and Barry. And hopefully I will be returning to the Train Masters studios one day and offer up some useful tidbits on something. In spite of how hot the studio got on those 2 filming days, (you can see that by watching the earlier videos and watch how haggard Trevor and I become), I had a great time. And Trevor, you're very welcome. Anytime, mon ami. Rethinking the new layout, maybe. On a daily basis, I come down into the basement and look at the space where the new layout will be, trying to envision what will be. I'm also reflecting on what I can truly consider achievable. I do really like the notion of running proper TT & TO operations with 5-6 miles of main, but is it a realistic goal for myself. There are serious time constraints, not to mention the budget limitations. I've operated on Bill Darnaby's Maumee Route, which is 10 scale miles of main, and on Trevor Marshall's Port Rowan layout, which has maybe 1/2 a scale mile. Both are a delight to run in their own right. For the last couple of days I've been reining in my extensive plans and thinking about a more modest layout that can be built in a reasonable time and offer up operational treats as well. Play value it's called. I'm thinking about modeling only 2 towns, Aylmer and Delhi. 2 of the larger communities on the Cayuga Sub, both of which offer up lots of local switching options. And with all the length I have available I can also have significant mainline runs and have the Redballs roll through, forcing the way freight to be out of the way at the required times. It's only in the notion phase right now, but it would be a less daunting task. I feel that right now the shear scale of the initial 3 level plan is creating a mental paralysis for me. I have to get my design brain trust over here with paper, pencil and beers. And we're back in the saddle again! This morning the first 2 cars to leave the new shop went into the mail. On their way to my favorite seismologist. Isn't it a tad fitting that they are Wabash cars? Both are O scale models offered by Rails Unlimited. With decals from Protocraft . It's nice to be getting back into the groove of building.